I love Mary Pickford's voice. Her humble, warm tone belies her magnificence. It is that of a supporting player, not the pioneering superstar that she was. Of all the things there are to love about Mary Pickford: The Muse of the Movies, that she tells so much of the story in her own voice is one of its most charming traits. This is accomplished with the use of several Pickford interviews, where she tells her story in a straightforward, and sometimes self-deprecating fashion. Muse is meant to be a tribute, but it never gets too gooey, because Ms. Pickford manages to keep things down to earth. The rest of the story is narrated with understated elegance by Michael York. That man's voice is like a cashmere blanket. Can we just have him narrate everything? Pickford and York are the primary soundtrack for a smoothly edited collection of film and archive clips. Some scenes are familiar, such as the wild crowds that greeted Pickford and Douglas Fairbanks on their legendary European honeymoon. Others, like the cheerily feminist conversation between America's Sweetheart and Amelia Earhart at Pickfair are excitingly novel. There are also a handful of interviews that stretch over several years, with clips of Lillian Gish in the 70s, Douglas Fairbanks Jr. in 1994 and Buddy Rogers in 1990. It was fun to hear Fairbanks share the familiar story of playing toy trains with Pickford at six-years-old, certain that this tiny woman was a little girl who had come to be his playmate. I also loved the sweet anecdotes Rogers shared, such as a moment in later years when Gish and Pickford sat face-to-face talking about their enduring affection for each other. It was especially interesting to see Pickford's daughter Roxanne Rogers Monroe in the only interview she ever gave about her famous parent. While she is respectful of her adoptive mother, you can feel the lack of intimacy in that relationship. And yet, Monroe is close enough to be perceptive about her mother, such as when she notes that Pickford, "loved Douglas Fairbanks and what they stood for." It is as remarkable an interview for the complexity you sense in her emotions about her mother as what she says. Personally, Muse was a rewarding experience, because it was a powerful supplement to all the Pickford biographies I'd been reading. I can't think of a less clichéd way to say it: the presentation of all these materials really brought her story to life. It was delightful to see as a fan who had already learned much about Pickford, but it would be equally enjoyable as an introduction to this woman who was a film industry pioneer in so many ways. The materials for the film were collected over the course of more than a decade from archives all over the world. One of the best acquisitions: several hours of film historian Kevin Brownlow's Pickford interviews. The story of how Eliopoulos discovered his subject is also fascinating. In the late 80s, he met fellow alumni Buddy Rogers at a University of Kansas reunion. This led to an invitation to Pickfair Lodge, and access to rare archives, footage and memorabilia. Features on the DVD include cast bios, a photo gallery and a pair of interviews: one a Q&A from the Toronto International Film Festival and the other an audio interview from NPR's On Film. I especially liked the insight the Q&A gave me into the film; the audience asked some tough questions. 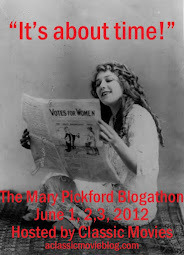 Check out the site for Mary Pickford: The Muse of the Movies here. There's a great gallery of Pickford shots. Thank you to Nicholas Eliopoulos for providing a copy of the film for review. 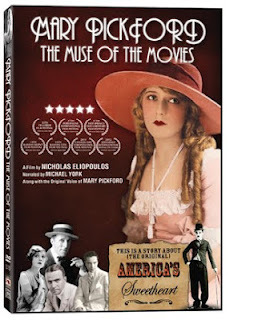 Mary Pickford AND Michael York....I might need to get this ASAP! You'll love it. It's such an affectionate portrait, but it's got real meat to it. That was a weird sentence, but you'll know what I mean when you see it.